Aquilegia are also known as Columbine and Granny’s Bonnet plants. Aquilegia vulgaris was the first cultivated species however Aquilegia canadensis is from Canada and is a pretty red species with nice spurs and a touch of yellow. Many pretty double flowers such as the ‘double white’ pictured right, are also available. Mckanna’s giants are a popular large flowering cultivar, readily available for sale online. One other favourite are the ‘Barlow Doubles’ , a spurless double cultivar with a wonderful range of flower colours from mauve to the sought after ‘Black Barlow’. 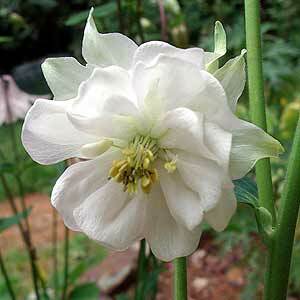 If you are looking for fragrance then try Aquilegia fragrans, lovely creamy flowers, and a nice perfume. 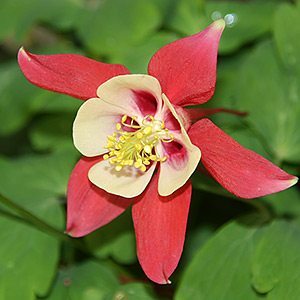 Relatively easy plant to grow as they can adapt to a variety of conditions., Aquilegia do best when they are grown in moist, rich, well drained soil in light shade. With attractive Lacy fern-like foliage, preferring a soil rich in organic matter. Aquilegia do require water during dry periods. A popular plant for cottage gardens where they will self seed. Aquilegia make an interesting cut flower. Pests are few, the usual suspects of snails around new growth, and occasionally aphids. Best suited to cool to temperate climates, not really the best for tropical areas. Try division of larger clumps in early spring, Aquilegia can also be grown from seed sown to a cold frame or hothouse when fresh in autumn or in late winter, leave until they get to good size and make sure they hardened off before being planted out.